Diversification is part of the investment strategies. Capital allocation is also one of the skills an investor need to master in order to meet his investment objective and target by taking a certain degree of risk. I have been considering to invest in REIT lately as I want to force myself to be discipline enough to spare part of my salary out monthly to invest in some lower risk & stable income investment provider for my retirement purpose. Then I came across AmFirst REIT. Out of the 8 properties shown in the latest quarter report, three of them are having a mere 72% occupancy rate. This was further highlighted in its annual report 2012 that the commercial office was oversupply in certain area. Management team has a big task to increase the occupancy rate of these 3 properties, but overall still manage to obtain a 90.3% occupancy rate recorded during the last quarter. 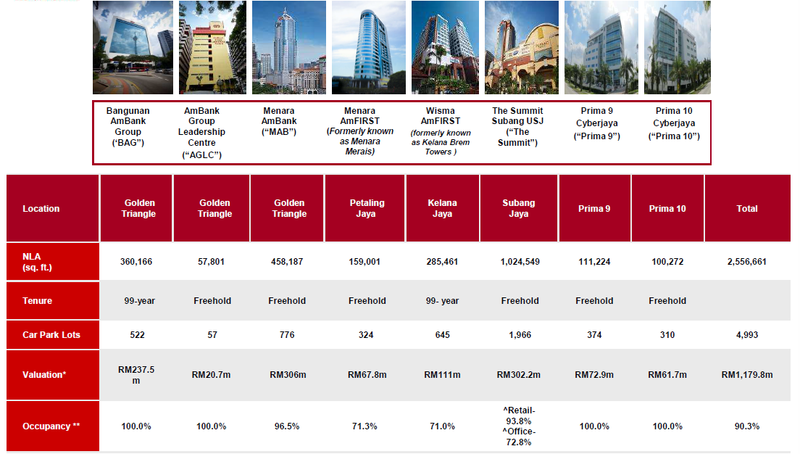 Looking back at its top 10 tenants based on rental income, 45% of the income comes from AmBank group itself. HP multimedia and RBC Dexia taking up the place at Prima 9 and Prima 10 respectively which AmFirst REIT acquired back in year 2011. 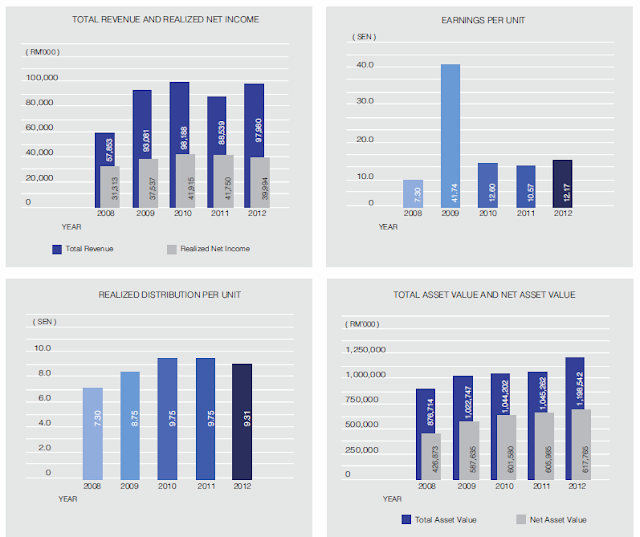 Total asset value and net asset value is improving for the past 5 years as it's normal circumstances that the properties do appreciate in value. However, its realized net income and distribution per unit did not show as significant as its net asset value. One more thing to note is its unit price always traded below its net asset value per unit. AmFirst REIT completed a right issue to raise a total proceeds of RM214million to pare down its gearing to 28% and to increase its share liquidity at Aug 2012. AmFIrst REIT declared an income distribution of 3.16cents for the six month period end Sept 2012. Recent acquisition of Jaya 99 will help contributes around 0.13 cents per unit. Expected the full year income distribution will be around 6.5 cents. Income yield is around 6.2% based on today price of RM1.05. Will it drops until RM0.90 per unit during a market crash as this will have a income yield of around 7%? Let's wait and see, at least you do not need to such homework when the market really crash or the price drops till your buying price. On the other hands, CF Liew published an interview with YP Lim, CEO of AmFirst REIT in his website. There were few questions being answered regarding the right issue, tenants mixing management strategy and rebranding exercise. Perhaps you can take a look.